Edited by D. L. Ashliman. @copy; 1997. The picture on the left depicts the Midgard Serpant preparing to take Thor's bait, the head of Hymir's ox Sky-Bellower. This illustration is from a seventeenth-century Icelandic manuscript, currently housed at Det Arnamagnaenske Institut, Copenhagen, Denmark. 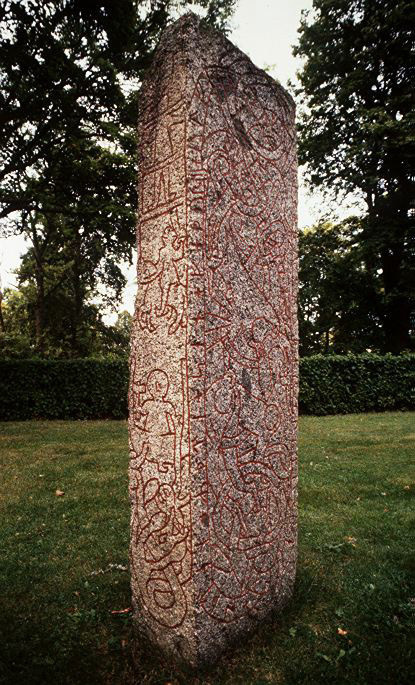 The picture on the right is a detail from a runestone or picture stone at Altuna, Uppland, Sweden. Thor, hammer in hand and with his feet protruding from a boat, has captured the Midgard Serpent, whose body winds about the bottom of the carving. Click here to see the entire stone. Thor went out of Asgard disguised as a youth and came in the evening to a giant called Hymir. Thor stayed there that night. At daybreak Hymir got up and dressed and prepared to go sea-fishing in a rowboat. Thor sprang up and asked Hymir to let him go rowing with him. Hymir said that he would not be much help, as he was such a scrap of a young fellow: "You'll catch cold if I sit as long and as far out to sea as I usually do." Thor, however, said he would be able to row a long way out from the shore, and that it wasn't certain that he would be the first to demand to be rowed back. He became so angry with the giant that he was ready to set the hammer ringing on his head. He controlled himself, however, as he intended to try his strength in another place. He asked Hymir what they were to take as bait, but Hymir told him to get his own. Then Thor turned away to where he saw a herd of oxen belonging to Hymir. He selected the biggest ox, one called Sky-Bellower, and struck off its head. Thor took the ox-head on board, sat down in the stern, and rowed. Hymir thought they made rapid progress from his rowing. Hymir sat in the bow, and together they rowed until they came to the place where Hymir was accustomed to sit and catch flat fish. Thor said he wanted row much farther out, and they had another bout of fast rowing. Then Hymir said that they had come so far out that it would be dangerous to sit there on account of the Midgard Serpent. Thor, however, declared his intention of rowing for a bit yet, and did so, and Hymir was not at all pleased at that. When Thor shipped his oars, he made ready a very strong line and a large hook. He baited the hook with the ox-head and flung it overboard. The Midgard Serpent snapped at the ox-head, and the hook stuck fast in the roof of its mouth. It jerked away so hard that both Thor's fists knocked against the gunwale. Then Thor grew angry and, exerting all his divine strength, dug in his heels so hard that both legs went through the boat until he was digging his heels in on the sea bottom. He drew the serpent up on board, staring straight at it. The serpent glared back, belching poison. The giant Hymir turned pale with fear when he saw the serpent and the sea trembling in and out of the vessel too. At the very moment that Thor gripped his hammer and raised it aloft, the giant fumbled for his bait knife and cut Thor's line off at the gunwale. The serpent sank back into the sea. Thor flung his hammer after it and people say that this struck its head off in the waves; but the truth is that the Midgard Serpent is still alive and is lying in the ocean. Thor clenched his fist and gave Hymir a box on the ear so that he fell overboard head first, but Thor himself waded ashore. Source: Abstracted from The Prose Edda of Snorri Sturluson, translated by Arthur Gilchrist Brodeur (New York: American-Scandinavian Foundation, 1916), pp. 68-70.